We’ve come a long way in 104 years of marking International Women’s Day. But far too many women remain left behind in far too many parts of the world. In Africa, a vicious cycle of HIV and AIDS and gender inequity continues to thwart women’s hopes for a healthy and productive life. AIDS is the number-one killer of women of reproductive age in sub-Saharan Africa and the world, and women account for more than half of the people living with HIV in low- and middle-income countries. It’s a human tragedy and an economic one. Beyond the epidemic’s direct costs, women are a driving force behind Africa’s economy, and their productivity loss takes a toll. 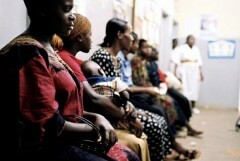 Women own nearly one-third of firms in sub-Saharan Africa and grow at least 80 percent of the food. Inequity in daily life explains much of the disproportional impact of HIV on women. Limited education, economic and social dependence on men, and gender-based violence severely restrict African women’s power over their own lives and health. An effective and widely available AIDS vaccine will help break through many of the related social and cultural barriers. Helping to ensure development of an AIDS vaccine is more than a job for those of us at the International AIDS Vaccine Initiative (IAVI) and our many partners. It’s a passion – from the clinician in Entebbe, to the community organizer in Kilifi, to the trial participant rolling up her sleeve in Kigali. At a young age, I learned the power of vaccines when my parents, who had lost a child to measles, took me to get the measles vaccine soon after it was introduced. As a senior executive in the vaccine industry, I have seen firsthand the transformative value that vaccines have brought to the developed and developing worlds. 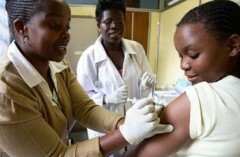 Just imagine what an AIDS vaccine could do for women in Africa. Today, they face heavy odds that they might contract HIV and potentially leave their children orphaned, but tomorrow they could be confident that they are protected from HIV and live healthy and productive lives. There has been enormous progress in treatment and prevention, but AIDS still kills 1.6 million people every year. I am proud to work daily alongside the thousands of dedicated scientists, advocates, clinicians, counselors, and community organizers – so many supported by the President’s Emergency Plan for AIDS Relief through USAID – who are devoting their lives and passions to achieving this sustainable solution for the women of Africa. As we collectively work to find an effective vaccine and ensure its swift distribution to all those who need it, we are already opening avenues to healthcare, education, and support that equalize and empower women.